The chewing…the scratching…the licking. If it’s driving you crazy, imagine how your pet feels! These behaviors are all too familiar to many pet parents and they can be signs of a significant health problem. It could be allergies, an infection, stress or any one of many issues, and it’s important your pet see the vet when these symptoms start to happen. 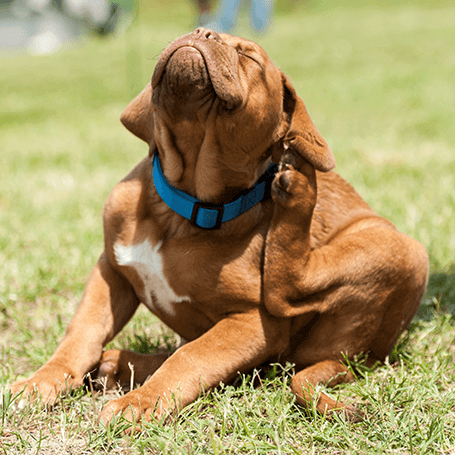 At Bell Veterinary Hospital, we offer complete skin and allergy care as part of our comprehensive suite of services. We’ll examine and test your pet and based on the diagnosis, provide you with treatment options that will provide relief for your animal friend—and for you. Treatment options vary depending on the cause of the issue, and while some are simple to resolve, allergies can be very complex. Some issues can be treated with a topical cream; others may require a combination of therapies and lifestyle changes. Whatever the diagnosis, we’ll work with you to develop a custom plan that meets your pet’s needs. If your pet is exhibiting any of the symptoms above, chances are they’ve been pretty miserable for quite a while. Schedule an appointment online or call us at (205) 709-8286.